Pope Francis is in Morocco. He is seen by some as an advocate of Islam (https://www.lifesitenews.com/opinion/pope-franciss-advocacy-for-islam-could-destroy-europe?utm_content=buffer0006e). Currently the Holy Father has issued an appeal for a peaceful coexistence between religions in Jerusalem (see article below), however peace is given by Christ. 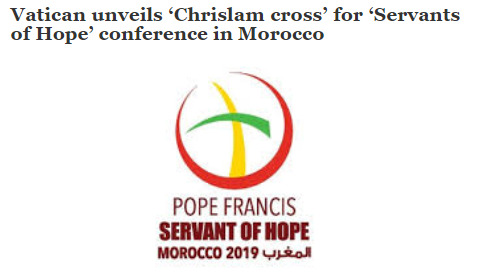 Another headline arose when Pope Francis told the tiny Catholic community in predominantly Muslim Morocco on Sunday that their mission was not to convert their neighbours but to live in brotherhood with other faiths (https://ca.reuters.com/article/topNews/idCAKCN1RC0EI-OCATP). Given that the pluralism of religions is willed by God can we expect the worship of Chrislam, or some other one-world religious deity, in our lifetime? I mean, we are all children of the one God. RABAT, Morocco - In what’s rapidly becoming the new papal normal, on the first day of his visit to Morocco, Pope Francis once again surprised friends and foes alike by signing an appeal that wasn’t on his schedule, this time on Jerusalem - calling for the city to be preserved as a “patrimony of humanity,” where followers of the three monotheistic religions are free to worship. “We consider it important to preserve the Holy City of Jerusalem/Al-Quds Acharif as the common patrimony of humanity, and especially the followers of the three monotheistic religions, as a place of encounter and as a symbol of peaceful coexistence where mutual respect and dialogue can be cultivated,” says the short declaration signed by Pope Francis and King Mohammed VI. Jerusalem’s multi-religious character, as well as the spiritual dimension and its particular cultural identity, must be “protected and promoted” so that Jews, Muslims and Christians all have “full freedom of access” and their “right to worship” is guaranteed, the two leaders said. The appeal comes three days after the King of Jordan, Abdullah II, visited Mohammed VI seeking his support to preserve the custodianship the Jordanian leader currently exercises over the holy sites in Jerusalem, which he perceives to be threatened by President Donald Trump’s decision to move the U.S. embassy in Israel to Jerusalem. Jordan’s monarchy has managed the Al Aqsa Mosque, the Dome of the Rock and the Church of the Holy Sepulcher in Jerusalem since 1946. Jordan had control over East Jerusalem and the West Bank until they lost to Israel during the 1967 Six-Day War. Israel, the Palestinian Authority, the Arab League, the U.S., the European Union and Turkey all recognize Jordan’s custody of the Muslim and Christian sites in Jerusalem. During his last trip, to United Arab Emirates, Francis also signed a declaration that hadn’t been announced when the program for the trip was released. On that occasion, together with the Grand Imam of Cairo’s Al-Azhar University, Sheikh Ahmed el-Tayeb, he signed a joint statement on “Human Fraternity” establishing the relationship between Catholics and Muslims as brothers, with a common mission to promote peace. When it comes to the Holy Land, the Vatican supports a “two-state solution” with independence, recognition and secure borders for Israel and Palestine. The Holy See has consistently called for a special status for Jerusalem, particularly its Old City, in order to protect and guarantee access to the holy sites of Judaism, Christianity and Islam. In 2017, Francis was part of a chorus of international leaders who criticized the decision of the Trump administration to recognize Jerusalem as the capital of Israel, expressing alarm that the announcement would provoke new tensions. “I pray to the Lord that such identity be preserved and strengthened for the benefit of the Holy Land, the Middle East and the entire world, and that wisdom and prudence prevail, to avoid adding new elements of tension in a world already shaken and scarred by many cruel conflicts,” he said.